The boy I met in Sangklaburi, Thailand. He was a delight to photograph. He pretended he didn't see me and I pretended I was not very excited photographing him. I love portraits that tell a story, and this one certainly does. Creative title, thought provoking shot, and congradulations. Congratulations Manny on your 7th placing and your high score. A great facial expression and tones that are magical. Congrats on your "Best of the Best" top ten finish Manny ! You certainly have found your niche. One of my ribbon picks! I almost never pick the winner..
Well never mind, still a favorite. Congrats on 7th place Manny! the hand just bothers me and I wish it had not been in the frame, either by cropping or pose. The face is just so well shot and has a great sadness, world weary look. the hand just distracts me. Heartbreaking. Great depth of field. I wish the hand was just a bit lower ... love everyting else. I dont get the title but Im digging the photo!! Powerful. Hope you do well. Great tones, I'll bet this will end up high, at least in top 10. I'm sure that some others have mentioned the out-of-focus hand, it would have been much better if it wouldn't be in the frame and as it is in the frame, then I think the photo would improve if you would have cropped it differently so the hand wouldn't be seen at all. I really like the lighting conditions and the shadows over the face. Best of luck. Incredibly good photo - contrast and b&w is spot on. compelling, slightly journalistic, slightly out of focus. very well done with a superb background, great detail and a nice level of contrast. This is a thought provoking image, for me the potential in this scene was treamendious. The expression on the face and in the eyes is greatI The posture of the head conveys even more emotion. I believe that were the arm and hand not in the picture it would have appealed to me more... its so hard to make a comment like that for me as many times those just are not what happens when you capture an image. I hope you do well with this. absolutely stunning. you can feel this image. great job! one of my top picks for the challenge. Very expressive. I don't think you'd lose anything by cropping out the blurry hand. Wonderful shadows composition and tone. Excellent! so close to perfect! the hand in the bottom left is really distracting, but everything else is incredible: expression, lighting, technical execution, composition, etc. keep it up! Wonderfull picture. Just the blurred hand is a bit disturbing. The face alone with the shadows on the right would've been great. 9. You've clearly captured a moment here. That is the sole purpose of photography, no? Wow, what a fantastic shot. Really, very good job. Beautiful light and .. well. .. everything. This is a wonderful photojournalistic portrait. There are two things that I think would make it even better, 1) Crop closer to the boy's head on the left to remove some of the dark area and 2) either have his hand in focus or crop just above it. I think the DOF might be a little bit too shallow since the left side of his head seems to be out of focus. Makes you wonder what he's thinking. Great shot. Nice portrait. Like the b/w and use of light and shadows. Stron, strong portrait. If only we could tell what he was thinking. The soft hand in the foregound detracts only a bit as the face just draws you in for full attention. The b&w / sepia was the perfect choice. Touching photo. His arm is a bit distracting but not enough to distract from his beautiful face. Awesome portrait. If ever someone wanted to capture a human emotion, they should study this first. This is in the top picks for me. A strong entry here!! Could really tell a story. Great capture of the childs expression. I love the tone as well. Striking!! This is natgeo quality, in my opinion. Love the texture of his face, the shadows are excellent, his eyes are profound...everything about it is right on...except, maybe, for the blurry hand in the foreground. I think maybe you could crop it out and still have an excellent photograph...but that's my only qualm and I'm really reachin'...overall, I love it. Thanks! Not sure about the inclusion of the hand, but otherwise a very nice child portrait with great natural light. I like the play of highlights and shadows and the thoughtful expression. very dramatic lighting. I like the far off gaze of the child. the out of focus hand is somewhat of a distraction. hey Manny this is absolutely amazing picture The lighting is so beautiful and the expression in his face I love it! Nice lighting and composition. Guess I would have tried for more DOF to have the hand in focus also. Very good capture... expression on his face speaks itself. Good B&W - it may have been better to crop the image to include only his face. This is a great look.. the child looks happy.. yet world-weary, as if he expects something bad to happen any minute. The lighting on the face is a little hard, and the eyes just a little dark, but that tends to happen with a bw/sepia conversion. I'd originally given this a 7, but I keep coming back to it, so I'm bumping it up to an 8. It's a nice portraiture. I am not happy with the out of focus hand on the foreground. The child does not look happy but this is not because of essential needs such as food. The facial expression is very moving because the feeling is that he is being deprived. Message edited by author 2004-10-09 00:00:15. Not quite sure about the title, but it's an excellent photograph of the child. Good composition and tones. The hand reaching adds another dimension, though I am a bit mixed as to whether this would have been better in focus. Overall, excellent, in my top 5 list for this challenge. Good tones, and interesting. Makes me wonder what the child is thinking. can't find any other proper words, just wonderful! remeniscent of one of my favourite DPC fotogs. beautiful toning; love the DOF. The decision to include the shadows (in fact highlight them through the title) was nothing short of brilliant. wonderful theme and a very moving image. Excellent shot. The lighting is perfect, as are the skin tones. His expression also tells quite a story. What a story you tell. This goes beyond beauty and speaks to the viewer. If you do not work for National Geographic, you should. 10. Composition, lighting, tone...as good as I've ever seen. I can really "feel" your subject. Good shot. Please don't take it bad, but I wonder about the out of focus hand in front; to my eyes it takes away from an otherwise excellent shot. But it is one of the best shots IMO in this challenge. This picture is so emotive. It's beautiful. I just want to put my arms around that child and make it all better! I love the cepia tones. I'm giving it a 9, only because I wish the hand wasn't blurry. The lighting here is quite wonderful. Really nice and emotional shot here. This one of the best of the week (10). Very strong image here. Lovely tonal range..no overexposed areas, great focus. Your subject conveys feeling to the viewer as well. Wonderful shot, so emotive. The shadows across his face only ad to the feeling. I love the title as well. I feel it would be better without the hand in front but doubt you had much control over that. Exposure and lighting are impeccable. Sharp detail on the skin gives a slightly gritty appearance to the image, which works well with the subject to convey an atmosphere. It's hard to tell what the emotion is, but it could be anything from despair to hope, which is impressive. The hand in the foreground is a little distracting, but I'm unsure whether it would have worked any better with deeper DOF... perhaps a tighter crop if it was candid, or moving the hand if it was posed? This is right out of National Geographic. You've captured the image perfectly from a technical perspective, and created strong emotinal appeal. *Outstanding* image! I don't understand the title, but it's a great shot! Beautiful light, tone and treatment. I sense that there should be sadness here which is inferred by the title rather than visible in the image (despite the child's distant expression). That doesn't detract from an excellent and clearly competent shot. A touching portrait. I can only imagine what is in the eyes of this child who has obviously seen much in his few years. Congrats, the only 10 from me in this challenge, so far. I'm just lacking words to describe how I feel. Truly awesome. Definitely one of my favourites. There is a lot of emotion in this shot and the lighting is perfect. Very very well done! Great capture Manny 100% sure this is you! Lost for words, the image speaks for itself, perfect! Excellent tones, well captured moment. The hand being out of focus doesn't distract much but I do wonder if it completes the image or if it would be better, cropped a wee bit from the bottom. Well, I can't decide. I love it, 10. 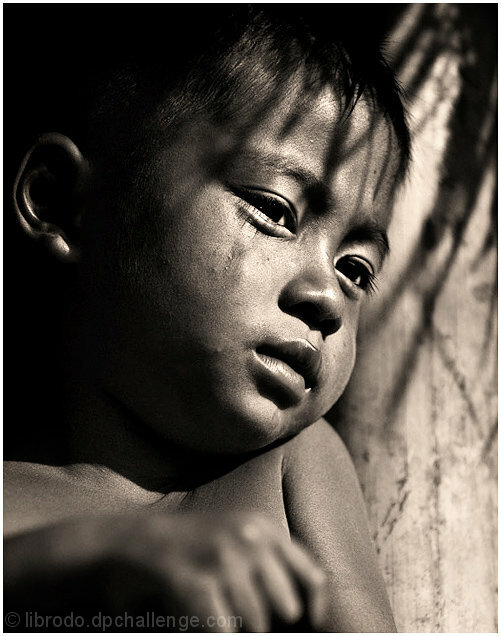 Very emotive; perfect moment caught and rendered beautifully with the lighting and texture. My only regret is the hand in the foreground being in such a different, softer focus. But exceptional work. after all the discussion of "emotions", to capture it in one so young ! This is my favorite type of photography. It would be a 10 for me if it was cropped without the hand due to the blur. Still a high vote. Love it ! Proudly hosted by Sargasso Networks. Current Server Time: 04/23/2019 12:00:33 PM EDT.